Author: Helen McCloy (1904 – 1994) came from a writing family and began her writing career as a journalist, first for William Randolph Hearst and then as a freelancer. Her first mystery was published in 1938 to great acclaim and she continued to write 13 novels about her psychiatrist-detective, Dr. Basil Willing, on and off until 1980. She published 16 volumes of non-series mysteries (and there are some posthumous collections of short stories, etc.) Her marriage to Davis Dresser, who as “Brett Halliday” created the Michael Shayne series, lasted from 1946 to 1961. She was the first woman to serve as president of Mystery Writers of America (1950) and received an Edgar award in 1954 for her mystery criticism. I think it’s safe to say that connoisseurs of detective fiction regard McCloy as one of the best American writers of detective fiction during her career. Her work is uniformly of a high quality; she’s skilled at planting clues and especially at delineating the psychology of murderers and murder suspects. 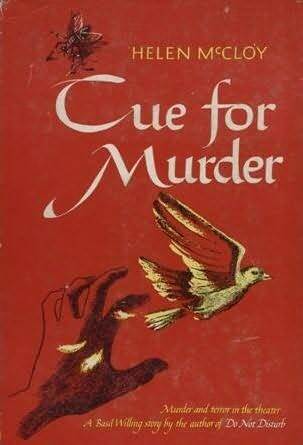 Mike Grost suggests that although Cue for Murder is considered to be one of her better novels, his preference is for her later works and regards her work after 1945 as better than her earlier books; I tend to agree. I have elsewhere reviewed what might be her most famous work, Through A Glass, Darkly (1950). Publication Data: The first edition is from 1942, William Morrow. The book was frequently republished in the 1940s, including its first paperback appearance as Dell mapback #212 in 1948, and then appears to have fallen out of publishing favour. Anthony Boucher selected it as one of his World’s Great Novels of Detection series for Bantam (F3027) in 1965, and it doesn’t appear to have been reprinted since. Amazon gives a peculiar listing which suggests that the book will be republished by The Murder Room (a subsidiary of Orion in the UK who’s been reprinting other of her titles) at the end of 2015. No e-book appears to exist. McCloy’s work was very occasionally adapted for television; “Cue For Murder” was adapted for a French-language television program, “Le Masque”, in 1989. I have not been able to view this production. Spoiler warning: What you are about to read will give away large chunks of information about the plot and characters of this murder mystery. You will probably learn enough here to be able to solve the mystery without really thinking about it. Please read no further if you wish to preserve your ignorance of this book’s details. You will also probably find here discussions of the content of other murder mysteries, perhaps by other authors, and a similar warning should apply. The book begins at an art gallery opening in Manhattan, filled with smartly-dressed women and attentive men. Dr. Basil Willing, a psychiatrist who consults to the police department, is attending, and meets Broadway star Wanda Morley and her surrounding players. Wanda’s new play opens that night; we see her with a handsome young actor, Rodney Tait, who stars with her and who is said to adore her. (His erstwhile girlfriend, also present, seems to disagree.) Wanda will share the stage with Leonard Martin, returning to the stage after a year’s illness. We learn that something strange has happened recently from a tiny snippet of a newspaper story, of the “human interest” variety. There’s a tiny knife-grinding shop sharing the alley with the rear of the theatre (see the map back’s map, nearby, for a better idea of what everything looks like and where it is). Someone has broken into the shop and used the equipment to surreptitiously sharpen a knife — and, before leaving, the mysterious sharpener has released the shop owner’s pet canary, which is found fluttering around the shop. Since the part of the dying revolutionary has no lines and is required to only lie there motionless until he is kissed goodbye by Fédora and then expires, Sarah Bernhardt used it as a publicity vehicle; she enlisted her handsome young aristocratic friends to play the role onstage, giving them all the excitement of acting without requiring any actual talent or experience. Edward VII was one of them, and he delighted in having gone unrecognized. The novel tells us that Wanda Morley learns of this and decides to revive the tradition; the producers don’t care who plays the role and are pleased to save the money required to hire a motionless supernumerary. So the casting of her lover is up to Wanda. Immediately before the play begins, an unknown man who will play Fédora’s lover is seen to make his way to the alcove where he lies down and begins to pretend to be near death, lying motionless. After the curtain rises, the only three actors who have any business near him are Rodney Tait as the doctor, Leonard Martin as the policeman, and of course Wanda Morley who kisses him good-bye before he is said to expire. Act I curtain and the stagehands begin to strike the set; of course, the unknown man is truly deceased. Dr. Willing comes up from the audience to possibly assist with first aid and notices something very odd. Although the dead man is lying in a pool of blood with a surgical scalpel sticking out of his chest, a passing housefly ignores the blood and seems fascinated with the handle of the knife. No one is quite sure why, but a number of witnesses note that the housefly will not leave the scalpel alone, even though the blood would seem to be a more attractive target. We also learn that a mysterious figure in a long dark cloak has been hanging around on a fire escape and no one can identify him … or her. Basil Willing soon identifies the victim as wealthy young John Ingelow, who is said to have been leaving his wife Margot, aka “Magpie”, in order to marry Wanda. Is Wanda’s romance with Rodney Tait just a publicity stunt? She’s certainly done this before with other co-stars, one of whom was Leonard Martin. Did she truly mean to run away with the victim, or is this merely another example of her desire for publicity? Wanda is constantly saying that she wants to leave all the annoying hurly-burly and glitter of the theatrical life and be merely a homebody housewife … was John Ingelow the man for whom she meant to abandon her career, or was she merely stringing him along for more publicity as a femme fatale? The investigation progresses, but the public’s demand to see the play now that it’s been involved with murder is so great that the show must indeed go on. A brash young playwright named Adeane seems to be the only person who wants to take the ill-fated role of the dying revolutionary ( so that he can get some attention paid to his unpublished scripts); the theatre is standing room only when the production resumes. And, as the experienced reader will have already guessed, Adeane is found dead in the same position in the same set at the end of Act I on re-opening night, and again only the same three actors have gone near him. Very shortly after the second death, Basil Willing works out the identity of the murder and, more importantly, the reason behind all the murderous activities. He confronts the killer in an exciting climax, and then explains everything. This is certainly a highly-regarded novel by a well-known and esteemed mystery writer; it’s absolutely worth your time if for no reason other than the collective intelligence of a lot of mystery critics suggests that it is. It really is a good book. Now that I’ve gotten that out of the way; I didn’t like this as much as I might have done — I didn’t even like it as much as I felt I should, given the admiration I have for other critics who think it’s a great mystery. There is some beautiful writing in this book, not just descriptive pieces like showing the reader what it’s like to be acting in a play, or viewing it from the audience. The beautiful writing is also concerned with what people are thinking and why they do what they do, and from that point of view it’s masterful. When McCloy talks to the reader about how shallow Wanda Morley is — selecting cheeseball revivals of lousy plays in which to appear so that critics will say, “Oh, why doesn’t anybody put Wanda Morley into a play that’s worthy of her talents?” — we get it. We get it in a way that adds value to the book because we grasp not only what underlies Wanda’s career, but that McCloy understands the theatrical milieu well enough to give us inside information about it and the motivations of the people within it. Wanda’s tired protestations — about how she’d really rather be a housewife, and yet she never actually does anything about achieving that goal — are both funny and entirely understandable. McCloy (and through her, Dr. Willing) understands human nature and understands how to tell us, and show us, so that we can understand it too. The point of this book is not so much whodunit, though, as whydunit. And that’s a slightly more difficult issue. It is clear from the way the material is presented that any solution to the mystery must explain (1) the fly that buzzes around the knife handle; (2) the repeated liberation of the knife-grinder’s canary from its cage, and (3) the motive for wanting to kill these people in the first place. There’s also a minor physical clue that must be explained away, the circumstances surrounding someone seen in a long dark cloak standing in deep shadow. (And there’s a tiny point about the nature of an outdoor clock at the top of a skyscraper that today’s reader will not really understand, since analog clocks are out of fashion, but it doesn’t really matter since the time sequences in the book are precise and clear.) For me, the only unclear point was the motive. That’s because, in the decades since 1942, other authors have manipulated these same facts for the pleasure of the reader. As far as the fly buzzing around the knife handle, well, I might have an unfair advantage since there’s a particular medical condition in a member of my immediate family that is directly relevant. But anyone who has read the Outlander series by Diana Gabaldon has seen the same material presented in the same way. The underlying principle was apparently known in Babylonian times. With respect to the liberation of the canary; that’s not really a physical clue but a mental one. If you understand why the canary was freed, you’ll understand the motivation for the crimes and, honestly, the symbolism is a bit tacky. It’s the kind of thing that sounds good in a book, but that I doubt would actually occur to someone. And as far as the person in the long dark cloak — I’ve seen that same idea used as the basis for the central “trick” in a mystery novel by E. X. Ferrars from about the same time period (the wartime blackout in England, as I recall), and I dimly remember but cannot name a couple of other novels that used it too. I’m not saying McCloy didn’t use it first, far from it, but at this remove I’ve definitely seen it used by others and thus it is not really surprising. The problem is that although I was clear about the identity of the murderer from a fairly early point, due to one of those “casual remarks” clues that I find so easy to spot these days (you know, when one character drops an off-hand remark about the earlier history of another and there’s no real reason for mentioning it), there’s no proof until very close to the end of the novel and that pretty much comes from the murderer confessing the details. Although the murderer’s motivation is lying right there for any police officer who cares to go looking for it, it takes a tiny leap from the facts to the circumstances which apparently no one but Basil Willing is capable of making, even though he doesn’t seem to have done so either. Instead, Dr. Willing pretty much does what I did; creates a list of circumstances and conditions that the murderer’s identity must meet, figures out whodunit, and then starts to investigate the motivation for the crimes. I mean, let’s face it. The murders are committed in front of hundreds of people; I can’t actually imagine that anyone would hope to get away with it in a plan that has hundreds of ways to go wrong and only one way to go right. I suggest that it’s much easier to acquire a sharp knife in dozens of ways that are easier and safer than by breaking into a shop and sharpening one. If the murderer actually wanted to kill the victims and ruin a third party’s life in the process, I can think of a lot easier ways than committing two murders in the middle of sold-out theatrical performances (a blunt instrument and a dark alley come to mind). What this book is about is a crazy person doing insane things, and mostly for the purposes of making an interesting mystery. And that kind of spoils my enjoyment. For a book that people esteem so highly for containing so much psychological insight, the central psychological issues are pretty much nonsensical. All things considered, there is a lot to applaud in this book and a small core of disappointment. Like I said, the writing is beautiful. You can see the production of Fédora unfolding before you (in fact, you see it so many times you’ll never need to actually go to see it should anyone be silly enough to mount a production). There are little moments of description that are so evocative and clear that you can see things happening, and take in tiny details of clothing and background. It all clicks because it has a basic rightness about it; the author has seen these things, either in real life or her mind’s eye, and is showing them to you as they are. Nothing is slurred or fuzzed over; if it’s in the book, it’s clear. Essentially everything about this novel is beautifully arranged; if it were a film, I’d be praising things like set design, costuming, and production values. You will believe most of the people are doing things for real reasons — the only exception being the murderer. It’s a truism of literary analysis that you have to work with the book you actually read, not the one you want to have read. Helen McCloy is a great writer and, let’s face it, Anthony Boucher thought this novel was worth including in a “Great Novels of Detection” series. Who am I to argue with Anthony Boucher? Well, all I can say is that if this book had left out the silly path from the murderous idea to the actual murderer, and allowed the murderer to act like a rational human, I think I would have liked it better. It probably wouldn’t have been a detective novel. It would have been an interesting crime novel at a time when such a thing was not yet possible (the psychological crime novel was still some years away in inception), because the only flaws in this book have to do with the mystery plot in and of itself. The murderer would have confessed, possibly after the first murder but certainly after the second, because the motivation which is given for the murders would have been completely accomplished and nothing else would have been necessary. Then Basil Willing in his psychiatrist’s persona would have been an interesting commentator on why the murderer did what was done, and this would have been an extremely powerful book. It’s been sacrificed for the puzzle mystery. Now, as a reader who has spent most of his life tracking down and appreciating well-written puzzle mysteries, I can’t say with a straight face that I think this is bad. Helen McCloy wrote good puzzle mysteries and I love puzzle mysteries. I just can’t help but wonder what would have happened if the puzzle mystery had been left out and the sheer intelligence behind this book had been allowed to shine through. In a way, there’s an analogy with something in the book. Wanda Morley picks bad plays in which to star, because they make her talents look more impressive. It makes me wonder if Helen McCloy wrote a poor puzzle mystery because it makes her beautiful writing look more impressive. It’s kind of a shame that the puzzle per se is the least interesting thing about a book that’s known as a great puzzle mystery … I suggest that you read it for yourself to see if you agree. Whatever she’s writing, Helen McCloy is worth reading. The first edition is from William Morrow, 1942. Other contemporaneous editions exist, including ones from Detective Book Club and World. First paper edition seems to be Dell mapback #212 from 1948 (it appeared in an edition of “Thrilling Mystery Novel Magazine” in 1946, it’s up to you whether that counts as a paperback or not). The Bantam Great Novels of Detection paperback edition, with entries selected by Anthony Boucher, is from 1965. I note that, as of today, on Abe Books, there’s a copy of the mapback edition that is signed and inscribed; even though it’s only in Fair condition, $30 plus shipping seems like a fantastic price for a copy. I may grab this one myself! The second most interesting copy available is a Very Good copy of the first edition in jacket for $50 plus shipping and this may actually be the one that is of more interest to collectors. I’m very fond of mapbacks, is all. The 1965 Bantam Great Novels of Detection series was a very good series, containing writers like Hake Talbot, Ellery Queen and Christianna Brand, and you could do worse than focus on collecting a set of them. This 1942 volume qualifies as a Golden Age mystery; sixth under “G”, “Read one book set in the entertainment world.” Everyone agrees this is one of the great backstage mysteries. I’m surprised I haven’t yet managed a complete line of six books, but I’m getting closer. 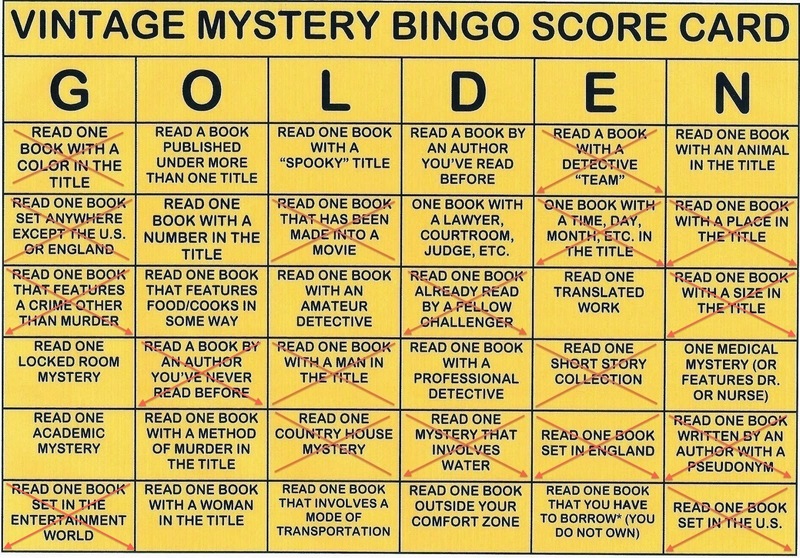 This entry was posted in 2014 Vintage Mystery Bingo, Detective fiction, Golden Age of Detective Fiction, Mystery, Mystery writers, Novel and tagged Anthony Boucher, Basil Willing, Edward VII, Giacomo Puccini, Helen McCloy, Mike Grost, Sarah Bernhardt, Umberto Giordano, Victorien Sardou, William Randolph Hearst. 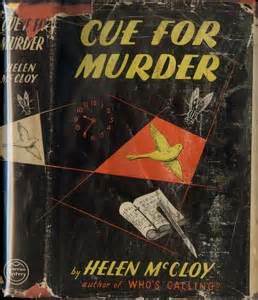 I think Helen McCloy was one of the best American detective story writers of the 20th century. Her recompense is that almost everything she wrote is out of print. I would get the hard cover edition of this book rather than the soft cover. The Dell map books are notoriously abridged. I have a copy of her book The Man in the Moonlight in hard cover and a map book. I found that the map book had deleted the epigraph to the book, and there were 6 deletions on the first page alone. After that, as the Continental Op might say, I stopped looking. As I recall, the Bantam edition was likewise altered to remove all the World War II references; this might have made it seem more up to date, but it also destroys the period charm. In addition to the novels, there is also a collection of the Willing short stories, The Pleasant Assassin. The story “The Singing Diamonds” is alone worth the price of admission. I was referring to the Bantam edition of Cue for Murder that was altered to remove the WW II references. Well this is probably the most critical review of Golden Age detective novel I’ve read in a long time. It’s not at all one of my favorite McCloy mysteries, but there is a lot to admire about it without going into deep analysis of its seeming lack of verisimilitude. First off, her knowledge of the theater world is top notch. 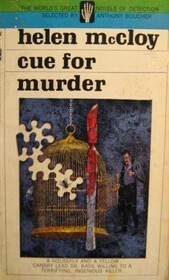 CUE FOR MURDER still stands as one of the best theatre mysteries by a US writer of this era. I also liked the way she imagined actors would deal with committing murder. For heavens sake, its a book! Comparing the behavior of these stylized fictional characters to how real people would behave makes no sense to me. I understand wanting a bit of reality in any novel, but these people live in world of theater and artifice. I’m currently working with one of the most unhinged theater people I’ve ever met in my life. Not only utterly disconnected from the real world but oblivious to the workings of basic stagecraft and the rudiments of acting and directing. Believe me, if you spend enough time in theater you’ll find enough “unreal” behavior and illogical contradictory personalities to fill a passenger cruise liner. It wasn’t hard for me to accept some of the symbolic actions or the more typically McCloy-style gimmicks in this book. She does similar things in THE DEADLY TRUTH, a far superior mystery. John, you’re one of the above-mentioned critics whose opinion I take seriously, and I actually think we agree on all but one point. I think it’s clear that I agree with you about her command of the theatrical milieu; I’ve said so above and it’s obvious even to my inexperience that she knows more than I do and makes it clear to the reader. I do think the writing is beautiful, and that’s not a word I throw around idly. It’s just the behaviour of the murderer that bothered me; it doesn’t make sense to me that that person conceived of those actions in order to harm the intended victim. In terms of the actual desired revenge, it’s like trying to commit suicide by flying on commercial airlines over and over again, hoping they’ll crash; the connection is tenuous and unlikely. The only reason I could come up with is that the murderer was insane (or had something in mind like The ABC Murders, but I think this is ruled out by the second murder). I have enjoyed mystery novels that have an insane murderer; Warrant for X, Cat of Many Tails, many others. I don’t mind that kind of solution. But when the protagonist is a psychiatrist dealing with an insane murderer — for instance, like Puzzle for Fiends — I would expect some sort of acknowledgement that the murderer’s actions aren’t sane and an investigative approach whereby the psychiatrist tries to figure out who’s crazy. Instead the psychiatrist ignores his training and uses deductive reasoning about things like the chemical nature of butyric acid and the behaviour of outdoor clocks coupled with physical clues like a marked-up script and the murderer’s clothing colours; more like Inspector French than a psychiatrist! Dr. Willing has the psychological indication (not really a clue) of the freed canary, and if he had had the police research the backgrounds of the three potential killers before the midpoint of Act III to see if there was an indication why someone might have done that, he would have been 90% to the answer. I really am sorry to disagree with you, if I actually am, because I think you always have a great deal of insight into every book about which you share your opinions, and I always enjoy how you express those opinions. But once I really started digging into this book, the actual puzzle just felt false and contrived to me. It’s so well written that it carries the reader along and over the illogic, but … in the end this for me was a B+ novel by an A+ writer. And I acknowledge that (a) I’m not at Boucher’s level as a critic, or yours, and (b) everyone thinks this is a great backstage mystery, and I have to agree. Perhaps I was having a bad day with this particular book; that’s been known to happen. I’ll have a look at it in a few months and see if my opinion changes; if you disagree with me to that extent, it’s worth taking seriously that I’ve erred somehow.